Tenshock RC906: yes or no ? Thread: Tenshock RC906: yes or no ? Is the lack of sensor really bad for crawling, even with 6 pole ? Last edited by ColdFox; 08-20-2016 at 12:59 PM. Re: Tenshock RC906: yes or no ? 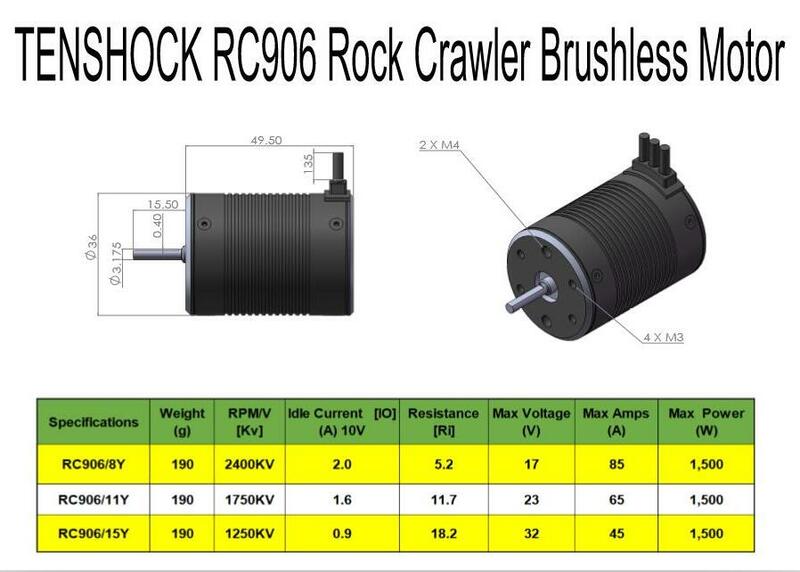 You will want the sensored brushless motor. I'm actually running one, Not just speaking blindly..
Its got a bit of cog, But its manageable, the pros far outweigh the single con of some mild cogging. Waterproof, and no brushes to let me down?? Its really a great motor,, As good as sensored? Not really no, But suprisingly good. Neither of which are nearly as smooth as brushed.. It really comes down to what pros and cons work for you..
That said, I'm so far loving my 906.. The 2400 would cog like a biotch compared to the other two but all of them would get the job done. For a heavy 6x6 I'd have to lean towards the 1750 on 3s powered by an sv3. You could certainly go with the 1250 and run 4 or 5s but then you're looking at a bit more money on the esc side of things. I have a 6x6 and tried running without sensor cable in non sensored mode and didn't like the cog or performance I also tired non sensored in one of my kyosho blizzards and for just driving wfo it's fine but to climb and crawl I pulled it and went with sensored set up. True it dosnt cog as much as with a 2 wheel drive rc. IMHO. That's all fine and dandy but without knowing what motor you had cogging issues with we'll just have to assume it was a 2 pole 6500kv. I ran a 5700 4 pole on my basher with 3s for a couple years. Yes it cogged and stalled a lot if I tried to crawl but I fully expected that. I have a little 1200kv 12 pole outrunner that is smooth as silk on the bottom. Kv and number of poles make a giant difference. All this KV talk reminded me I didn't mention I'm running the 1750 kv. White Trash is right about the 2400 kv variant. Glad I chose the 1750. Very true I didn't give details and the number of poles can help. In the 6x6 I have a ble and trail master 13t I tried it in non sensored and did care for it, it was too fast, with sensored mode on it was a major improvement . In one of my blizzards I used a 4 pole 3300kv sensorless Dynamite esc and motor. It did cog at lower speed and would stall and run hot with a 11t pinnion and 87t spur it was hard control at low speeds with the coging going larger rocks and other objects . My other blizzard has a Dynamite sensored brushless motor and esc 13.5t 4 pole and is my favorite to run, with the sensored set up I can climb some objects and have much better low speed control. Me and my son used our blizzards in a local 6g type comp this year and did well even though we ran for fun. I used the hobbywing just stock sensored set up in my stadium truck and like it over the Dynamite 3300kv tazer combo. I don't think I've had a 2 pole brushless motor. So it may just be that I've had bad experiences with Dynamite non sensored products. Last edited by snapon boy; 11-07-2016 at 10:38 AM. Where did you plug the sensor and 3rd wire I to the 13t trailmaster? Dynamite? No wonder you had issues. I've had terrible luck with their brushless line. Try a lower kv motor and you'll be surprised at how decent it is. I have a older gray can trail master brushless sensored 13t motor. My lhs is a horizon store and that's all they carried. I had bad luck with all of there stuff as well. Ahhh that's right. When I read 13t trailmaster I think of the brushed motor I used to run. The industry needs to standardize and leave turns to brushed and kv to brushless so dumb truck drivers don't get confused. Agreed. I've been looking at a few of the brood products lately but I saw him post about brushless motor some where. May need one. I've had a couple holmes motors and they're pretty sweet. My crawler has a 35 turn axle buster from brood in it. I'll never run a motor with normal magnets again. Technically it is a 13.5t trailmaster BL on the can, but I do agree about turns vs kv naming for consistency. Won't find a single bl with turns in the name, or a brushed with kv in the name on my site these days. Just that one trailmaster got it. The equivalent speed trailmaster these days is a 8.5 turn. Don't tell anybody though, it would scare them to know it's so low. Ain't that a race motor turn!?!? I used to run sensor less in my crawler, 8 years back. I can't stand the best outrunner these days. It's brushed or sensored or nothing for me. Pet peave to have a motor hold back the rig. Ahh so you're to blame for that eh? I'm sensored or brushed only these days too. Sensor less is decent for bashing but that's about it. Have you had time to put a new wicked magnet motor together yet? Put my 1750kv Tenshock 906 to its first real ENDURANCE test today, Did a 126 gate scale adventure and I could not be more pleased, I will for sure be ordering a second one ..
Not a one time today did I have to struggle with any cogging, Its something you have to be trying to make it cog to make it happen, if you just drive, Even slow, It just works.. I'm driving the red Ford. Last edited by Capwn; 08-21-2016 at 08:56 PM. I use 1250kv and 4s on my XR10. Startup is not as smooth as brushed, but otherwise i quite like them. For people that have ran or run these motors, do you guys think it would be a good fit for a twin hammer running a scx10 trans on 3s? I was thinking about getting either the 17k or the 12k motor. I cant decide and just wanted an opinion. What will you be doing with the truck?